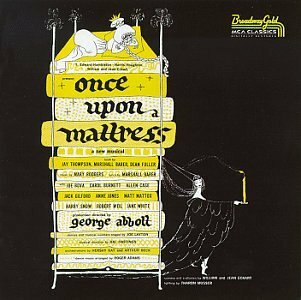 Once Upon a Mattress is a musical comedy with music by Mary Rodgers, lyrics by Marshall Barer, and book by Jay Thompson, Dean Fuller, and Marshall Barer. It opened off-Broadway in May 1959, and then moved to Broadway. The play was written as an adaptation of the Hans Christian Andersen fairy tale The Princess and the Pea. Once Upon a Mattress was first written as a shorter play at the Tamiment adult summer camp resort, at which Jack Sydow was present. The play was later expanded for the Broadway stage. Initial reviews of the play were mixed, but critics and actors alike were surprised by the show's enduring popularity. Once Upon a Mattress is a popular choice for high school drama programs and community theatre groups. 2014 Spring Musical Legend High School Parker, Colorado. 51st Tony Awards: June 1, 1997 Once Upon a Mattress 1996 Broadway revival " Shy " Sarah Jessica Parker. Matthew Morrison and Zooey Deschanel performing "In a Little While" from Once Upon a Mattress.